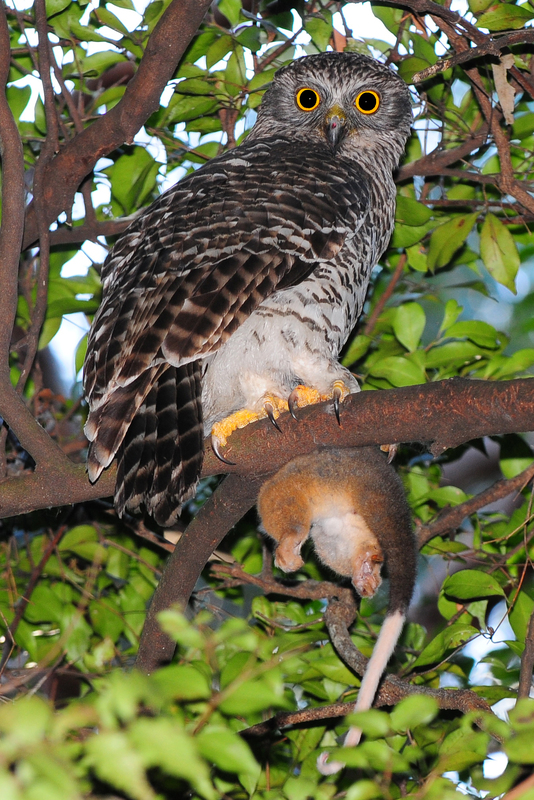 Today I am writing about one of the coolest birds of prey in Australia, the powerful owl. These large owls grow up to 65 cm long, making them the largest species of owl in Australia. They have a smaller head than most other owls and are considered a member of the hawk-owl family. They are excellent hunters, mainly catching possums and gliders, but they will also catch bats, wallabies, large birds and even occasionally koalas. They are often seen roosting during the day with their prey, waking up to snack on it and guarding it from other predators. Powerful owls mate for life and they help to raise the chicks together, with the male doing most of the hunting. The female usually lays 2 eggs in a large hollow in a tree. Powerful owls are found in forests throughout the east coast of Australia. They are also sometimes seen in public parks and reserves in the major cities of Melbourne, Sydney and Canberra. They are not in danger of extinction, but their numbers are dropping in some areas due to habitat loss. Are there any other interesting facts that you would like to share about powerful owls? Is this a kids website? ?